LUX: We just looked at the atelier where you create your individual pieces, and what struck me was the creativity and ‘anything goes’ style of these one-offs. 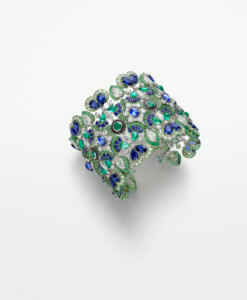 Is Chopard becoming more creative or has it always been like this? Caroline Scheufele: I think Chopard has always been known for being one of the most creative in the watch and jewellery market. But over the years there has been a big evolution – especially over the past 10 years when I started to introduce the Red Carpet collection that we release annually in Cannes. We started with the 60th anniversary, so crazily enough I said we will make 60 special pieces, and every year we add one, so we are now up to 71. It’s a big challenge for the workshop. 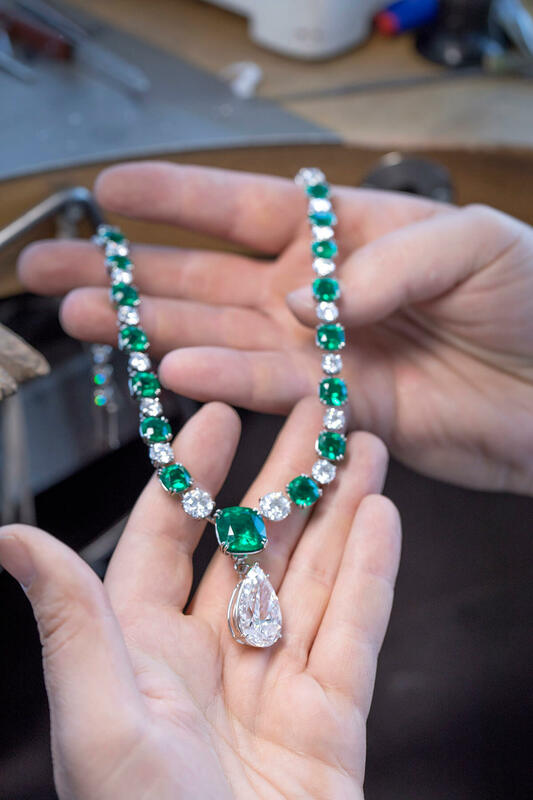 Over the past 10 years there was a big evolution and maybe even revolution within high jewellery because we started to work a lot with titanium and even now ceramic and aluminium, and you get a completely different finishing look than if you only work with gold. Personally, I love to wear big earrings and that’s why we started a lot with titanium because normally big earrings are very heavy because of the gold, and the worst thing is when you sit at a dinner and you see a woman taking off her earrings on the table because they hurt. That’s also the practical side of it, if you use titanium – like on the big orchids in this year’s collection – they are like feathers. And now we can colour the titanium, which we can’t do with gold. When we started my father said, ‘What are you doing?’ I said, ‘It’s not written anywhere that diamonds have to be set in gold.’ It’s just historically always been done like that. LUX: You were inspired by your recent travels? Caroline Scheufele: Yes, I travel a lot. I just came back from two weeks in China which is always very inspiring. And there are a lot of things you can pick up in ancient architecture or colours or music. But there is not a given moment when you say, ‘OK, today I’m going to sit down and be creative.’ It doesn’t happen like that. But it often happens when I travel which is good because I always come home with ideas and you always need new ideas. I love architecture. I think if I would not have been doing what I do with the family I probably would have gone into architecture. LUX: When you are travelling, do you have to force yourself to go out of the usual itinerary to get to the inspirations? Caroline Scheufele: I fight with my team because this time, for example, I was two days in Xi’an, an old capital of China where they had the first Emperor, and very close to the Terracotta Warriors. I said, “No matter what, I am going there. Please put these two hours into my programme.” And like always my team say, “Ah no, no but you have to do this…”. I mean, I was in China five times last year and I still haven’t seen the Great Wall. LUX: For the Cannes unique pieces is it really carte blanche? You create whatever you want and clients will buy them? Caroline Scheufele: It’s pretty much carte blanche. We do have a theme, but otherwise anything goes. LUX: Do you worry they won’t get sold? Caroline Scheufele: No… we have a very nice group of clients who are very attached to the brand and they get to see them pre-Cannes. And then we may have other customers who want the pieces but we only make one of each. LUX: China has gone from zero to biggest market in the world in the past 15 years. How have you established yourselves as the brand with the power that you have over there? Because they didn’t know Chopard previously. Caroline Scheufele: We started with some agents and now we run China ourselves, we have our own office in Shanghai and another in Beijing and a big one in Hong Kong. First it was more about watches but now the Chinese have discovered branded jewellery. We have our Chinese ambassadresses and when they wear something, the next day it can be sold out. They are very celebrity-driven so it’s a lot about social media. China is also so big. When you go to a city like Beijing, it’s 22 million people, almost three times Switzerland. The dimensions are so different. Last time I met a very nice successful lady, who runs a family business, but they have 320,000 employees – that’s the whole city of Geneva! LUX: You have to visit China in person, right? Caroline Scheufele: Yes, they appreciate meeting the family. They like the personal interaction. We had an exhibition at a luxury fair in Hainan, and we printed a book in Chinese. I gave it to a lady and the next morning she knew everything in the book, she had read the whole thing, which probably wouldn’t happen in America. LUX: Is the perception of luxury changing in China? Caroline Scheufele: Certain brands were very popular in the beginning when China opened up, and now certain people in the Chinese elite are going for smaller brands because it’s more chic or less widely seen. I met a very interesting professor from Beijing University who was giving some background on China, about how things change quickly. Within the past three years, 100 million people moved from poverty into the middle class but in the next six years it will be 300 million more. They set themselves goals and visions and they really do them. LUX: Are consumers around the world less loyal to brands and is that a problem? Caroline Scheufele: It’s not a problem, it’s an opportunity. It’s also stimulating for us to be more innovative and more creative. And fast. LUX: Is speed an advantage because you’re a family company? Caroline Scheufele: It’s an advantage because if something is urgent we can make things quickly because everything is in-house. Also we can stop something and say, ‘Now we make this engagement ring because their engagement is the day after tomorrow.’ Which in other companies is more complex. They have [to get] 10 people’s signatures before they even start the design, and we’ve already made the piece. LUX: Have tastes changed around the world in the past few years? Caroline Scheufele: Yes, jewellery has become more democratic in a way, how women wear it. So, mixing colours, mixing shades of gold. With a beautiful diamond ring you can also wear it with jeans, you don’t need to have only the long dress to go with it. So I think yes, it has changed. LUX: I might have this completely wrong as an outsider, but it seems to me that jewellery used to be made by men and bought by men for women, and you’re a woman and your customers are women. Caroline Scheufele: Women and men. Both. I sometimes call men and say, ‘Your wife’s birthday is coming up, I hope you didn’t forget it!’ But yes, previously jewellery was always something that you expected to be given as a present. Whereas certain women spend easily, they go shopping for designer clothes and they spend $10,000, $20,000 without a problem, but to buy yourself a beautiful diamond ring was not so much on the menu. I think now a lot of women are independent, they make their own money, they also buy their own jewellery, they might still be married but they sometimes go, ‘Ah, this is new?’ ‘Yes, I just bought it for myself.’ The behaviour of buying has changed, also with the advent of e-commerce. LUX: Is that going to become more and more important? Caroline Scheufele: We have to work with both. I still like magazines, I’m not somebody who can read a book on iPhone. I still like the touch of paper, but maybe I’m not this very young generation… I still think there is a difference. A lot of people get information first online and then they go to the destination, physical shopping. So, the digital side is important. How you present your company. I think there will always be stores. But the stores today have to be much more of a lifestyle experience. The people who sell have to be better. It’s not good when the client knows more about diamonds than the salesperson. 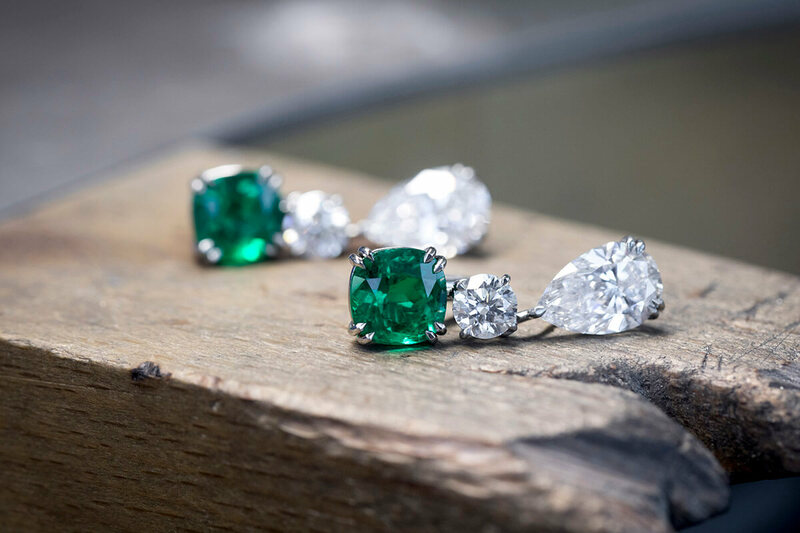 LUX: Do clients care about your decision this year to only use Fairmined products? Caroline Scheufele: I think it definitely appeals a lot to the younger generation because they are much more alert, today, about the planet, about sustainability and responsibility. The other day I had lunch with a friend and the son came in. We were talking about tennis shoes and he said, “Mummy no, no, no, you cannot buy this brand. It’s not good because they use kids.” And the mother said, “Ah.” The little one is six years old. So there is much more information and I think we all have to take care of the planet, we cannot just wait for the next generation to clean up. LUX: You met the miner who mined the diamond you bought from Botswana, the Kalahari Diamond. Is the female empowerment element important for you? Caroline Scheufele: It is important. And what was the beauty of the Kalahari is that a woman found it and it was on a Sunday. For me this was a unique experience, because I really followed everything from A to Z – from the mine to the cutting to the design. And then obviously we presented, we made the presentation in Paris and we invited the lady who found the stone to the presentation. And she had never been out of the village, so they had to get passports and visas, and she came with her son and then they went to Versailles. They were there one week, and in Versailles the son said, “Is this ice?” because it was the first time he had seen snow. So that, it was nice, it was actually nice. LUX: Do you get inspiration for your next ideas in unlikely places? Caroline Scheufele: Yes, I do. Once, we had rented a boat and we were very unlucky because it basically rained for the whole week, so what do you do? You watch movies, you read, you go and eat, you read more, you listen to music. And I was looking around, thinking, ‘How important the sun is!’ And your mood is down, and that’s when I had the idea of doing the Happy Sun collection. I designed it in the rain.